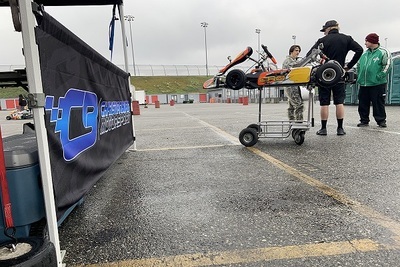 February 6, 2019 - Grand Junction, CO - With the goal to build his regional and national level race team, Christian Bird and Christian Bird Motorsport are set for their first event of the 2019 racing season. Set to take on the ROK Cup USA Challenge of the Americas, the Colorado based team will make the trip to California to compete at the Calspeed Karting facility in the shadows of the Auto Club Speedway. "We travelled to California this past weekend to finalize some pre-season testing," explained Bird. "Looking forward to getting the season started and even though we have a small team at the first event, the plan is to continue to grow the program throughout 2019." Commencing their season at the Challenge of the Americas, Christian Bird Motorsport will enter a pair of drivers in Colton Timmons and Liam Letzsch. Timmons, who has competed regionally for the past few seasons, has joined CBM in an effort to expand his racing program and continue to develop his race craft. Working with Christian both on and off the track, Timmons will see action in the ROK Shifter category as he aims for a solid start to the season. Liam Letzsch is prepared to do battle in the ROK Junior category, one of the top karting divisions in North America. Competing aboard an OTK branded FA Kart, Letzsch will be under the watchful eye of Christian Bird as he looks to take advantage of the experience he can gain at the Challenge of the Americas, and utilize that in his home state of Colorado. "I pondered the idea of competing in the ROK Shifter class but decided that I need to focus on my business and my customers," Bird continued. "Drivers looking to compete on the national stage at an affordable rate, obtain driver coaching, data and video analysis as well as tent and transportation services in the future are invited to contact me anytime. We plan on competing on both the regional and national level, and fully supporting all of our drivers and brands that we sell." In other Christian Bird Motorsport news, a new website is currently in production and will be launched in the coming days. Stay tuned! For information on Christian Bird Motorsport, race team opportunities, product sales and/or driver coaching, please contact Christian Bird via e-mail to CBird324@gmail.com or by phone to 970.201.4662. Christian Bird Motorsport can also can also be found on Facebook, Twitter and Instagram by searching Christian Bird Motorsport. Stay tuned for a new website coming soon.